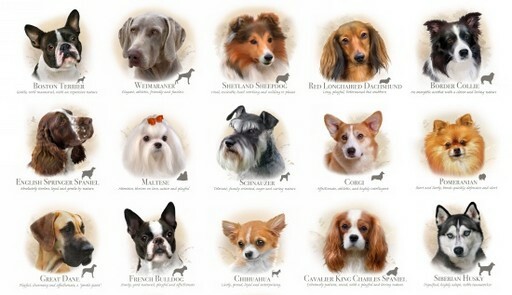 Description: 15 different dogs with their attributes. Great Dane: Playful, charming and affectionate, a “gentle giant”. Boston Terrier: Gentle, well mannered, with an expressive nature. Chihuahua: Lively, proud, loyal and enterprising. Cavalier King Charles Spaniel: Extremely patient, social, with a playful and loving nature. Siberian Husky: Dignified, highly adept, noble team worker. French Bulldog: Sturdy, good-natured, playful and affectionate. Weimaraner: Elegant, athletic, feindly and fearless. 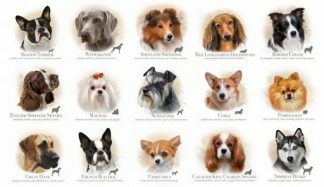 Shetland Sheepdog: Vocal, excitable, hard working and willing to please. Red Longhairded Dachshund: Long, playful, determined but stubborn. Border Collie: An energetic acrobat with a clever and loving nature. English Springer Spaniel: Absolutely tireless, loyal and gentle by nature. Maltese: Attentive, thrives on love, active and playful. Schnauzer: Tolerant, family oriented, eager and caring nature. Corgi: Affectionate, athletic and highly intelligent. Pomeranian: Short, lively, bonds quickly, defensive and alert.